Quickbox Solutions, located in Lincolnshire are a leading UK manufacturer and supplier of bespoke plain or printed cardboard boxes and packaging supplies, delivering consignment presentation when you need it. 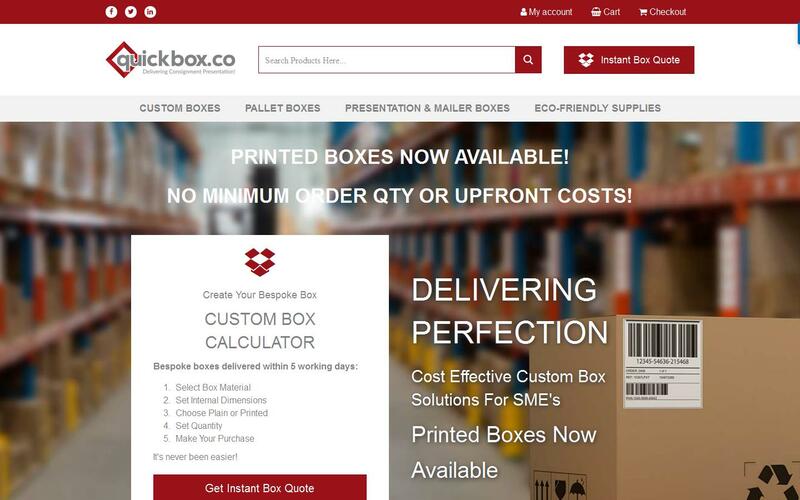 Our cost effective custom box calculator allows you to choose the box material you require along with internal dimensions and sizing, quantity and whether you need the box (boxes) plain or printed. It’s never been easier to order your packaging, with items being delivered within 5 working days. E-COMMERCE start-ups the nation over are being given a professional appearance from a South Bank packaging specialist. Prompt and professional service with first class results. Very impressed with the speed of order to delivery.